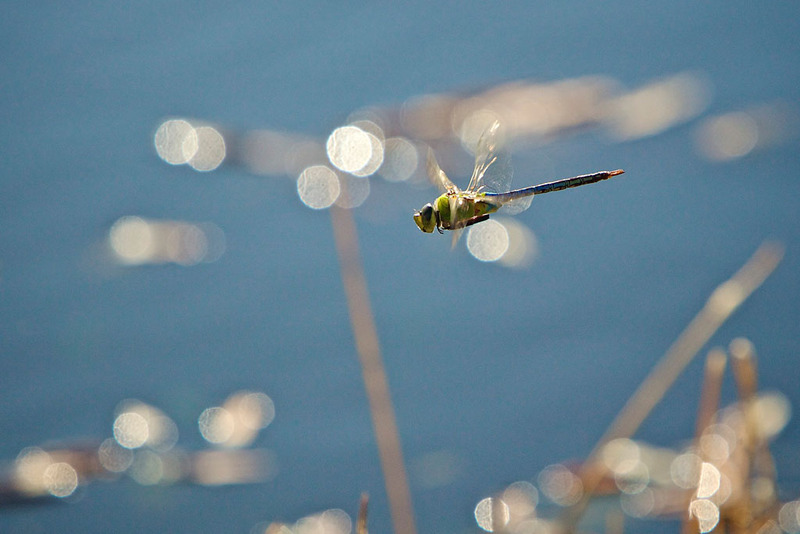 During our afternoon shoot at the TDS Photography Workshop in Sonoma County, a curious Dragonfly became interested in me. He would buzz by, hover for just a second, dash off, then come back for another look. Dragonfly captured with a 70-200 mm f/2.8 Canon Zoom with 1.4X tele extender. Click on image for larger version. I added the 1.4X tele extender to my Canon 70-200mm f/2.8 zoom (on a 5D Mark II) and did my best to photograph the speedy Dragonfly. The afternoon light was strong and reflective, so I added a polarizer to cut down on glare. I do, however like the water reflections and boca in the background. Speaking of the Workshop, we had a great day yesterday, combining classroom work with a model shoot and landscape photography at a vineyard. More on that later.